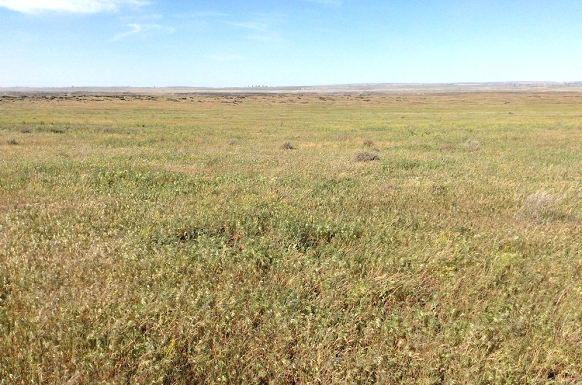 Does your rangeland look like this? FIGURE 1: Rangeland invaded by annual grasses. Grant County. Photo: DNR. Perhaps you’ve heard this before, but the USDA Farm Bill has a program for that! Working with lessees, local Conservation Districts, and the USDA-Natural Resource Conservation Service (NRCS), DNR has helped to facilitate some amazing projects to improve our State’s rangelands. Best of all, lessees are reaping the rewards: as animals have better gains, habitat is improved, and the producer may qualify for supplemental payments. Now back to the images of rangeland and our questions. 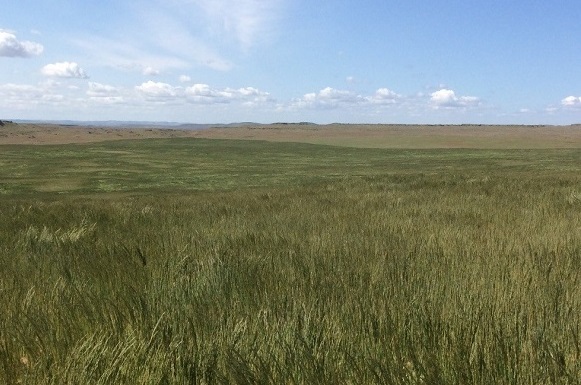 Altered fire regimes, historic grazing practices, and invasive plant encroachment, have converted much of Washington’s native rangeland to something resembling the parcel pictured in Figure 1 that has been invaded by annual grasses. Restoring this rangeland after it has been invaded by cheatgrass, medusahead, and bulbous bluegrass is an uphill, if not a seemingly insurmountable battle. This is where a program like the NRCS Environmental Quality Incentives Program (EQIP) can help. Conservation Districts and the NRCS provide technical support, financial assistance, and flexible conservation planning that can make projects like range reseeding successful. Figure 2 demonstrates a successful EQIP enrollment in Whitman County. Here, our lessee’s dedication to excellent land stewardship and partnership with the local NRCS office culminated into a massive range restoration project. Hundreds of acres of rangeland invaded by annual grasses have been reseeded to Sherman big bluegrass. Excellent forage value, and vastly improved wildlife habitat are just some of the rewards of this reseeding effort. Why not your lease or land? With many programs available, and the need for economically and ecologically productive rangelands so great, the opportunity to participate in these programs is hard to ignore. Talk with your local DNR land manager early and often. We are more than happy to help. An conversation early in the process can help ensure a smooth enrollment in to the program. Be familiar with your lease terms, expiration date, and project timelines. Frequently, certain lease terms must match project terms and understanding timelines is crucial for a successful enrollment. Be sure your Conservation District or NRCS office knows that you are planning projects on State land. Often, land ownership can be an overlooked piece of the puzzle, leading to late notification of DNR land managers, thus limiting enrollment options. Foster good relationships with your local Conservation District and NRCS office. Program sign-ups are almost always limited, so having good communication with your local conservation offices is essential to knowing what programs are available when. This entry was posted in Conservation, Management by The Dirt: News People Leasing Washington State Trust Land for Agriculture. Bookmark the permalink.